Two Sneden Families or One? Alice Gerard, author, community activist and municipal historian of Palisades, has a long list of books to her name, as well as several articles in South of the Mountains. We hope this is the first of a series of articles that features one of the Dutch sandstone houses of Rockland County. We begin with the house at 227 Old Mill Road in Valley Cottage. Christine Kowalski, the Museum Services Assistant at the Historical Society of Rockland County, has been on the job nearly two years now. In June, Jennifer Plick, our education coordinator, designed an inspiring program for second graders at Laural Plains Elementary School in New City. COVER PICTURE. 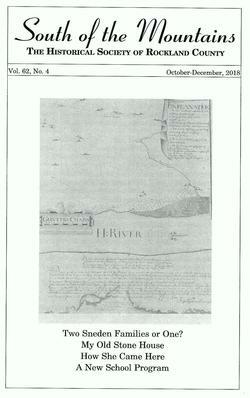 Map made by surveyor James S. Haring Jr. in 1876 that is an exact copy of the original 1745 map made by surveyor Philip Verplanck of the Lockhart Patent. #7 (the house on the river just to the south of the salt marsh) identifies "Sneedings house the flerry."